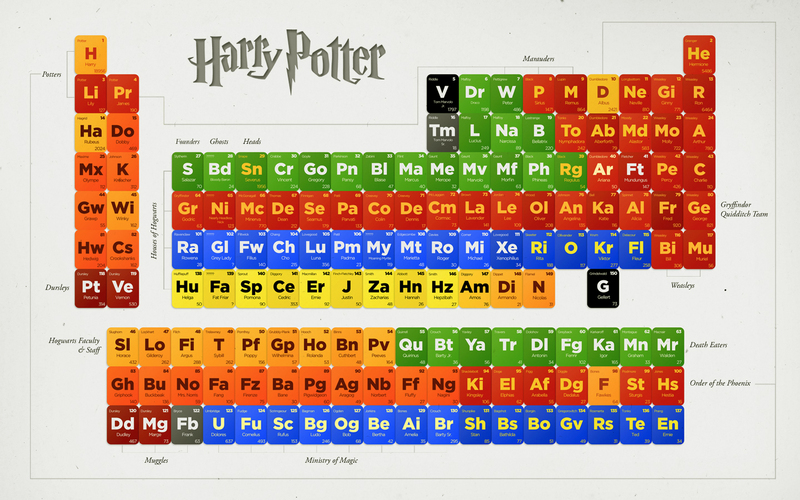 HP Periodic Table of Characters. . HD Wallpaper and background images in the Harry Potter club tagged: harry potter wallpaper characters. I found Bellatrix, number 19. WOAH! Must've took a while! I wanna learn this science!! There needs to be a line connecting Ginny to the Potter line! epic man. epic. i fugging love this! This is my favorite periodic table in like the whole world. It is so extraordinary. IF SCIENCE WAS LIKE THIS IT WOULD B MA FAVE SUBJECT! star_michelle, Tom Riddle Sr. Was Voldemort's father. He was a Muggle. He left Merope Riddle (nee Gaunt) when she stopped giving him a love potion and told him she was pregnant. After Voldemort left Hogwarts, he returned to Little Hangleton, where hiis father lived, and killed his Muggle parents and grandparents. Marvolo Gaunt is Merope's father. Love this!!! Got a bit confused with Jr. and Sr. Riddle though but now i get it. Great!! this is so funny and cool! This is so great. I want to make one of these for my own characters now!